RV travelers are an enigma to me, and today I’m exploring their world. It seems to me that a life of adventure, with your home in tow, would be so carefree and exciting, especially while seeing all that America has to offer! Have you ever thought of hitting the road in an RV, and taking an extended road trip for, well, for as long as possible? The number of Americans owning an RV is at a record high. More than nine million American households own an RV at this time, which is the highest ever recorded, according to the Web. Did you know that gas prices would have to double over current levels to make RVing more expensive for a family of four than other forms of travel? I recently contacted a friend from my high school days who is an RV travel enthusiast. Kathy Alexander and her husband Bill traveled throughout the U.S. in their RV for about six years, and even worked at some of the RV parks along the way. They loved their journeys, and I consider Kathy to be an expert on this topic. Kathy and Bill retired in 2006 and 2001, respectively, and had talked about traveling for a while, according to Kathy. So in 2005, they sold their home as they knew it. They broke into RVing on their first trip by spending a year with family in Salt Springs, Florida, as their retirement vacation. Later, they learned the hard way that you do not want to camp and work at an RV park in Lake Panasoffekee, FL, in the summer if you can help it. “Big mistake! You do not work in Florida in the summer. Then we went to a KOA Campground in Trenton, Georgia,” Kathy continued. During their stay they visited many wonderful places and beautiful sights. They made a return trip the next year and stayed for another summer and saw many more sights, including the Grand Canyon, Yellowstone, Teton National Park, Craters of The Moon, and many more places. “It was a long trip out and back, but so very unbelievably enjoyable,” she said. The Alexanders have also camped in Michigan, New Mexico, Texas, Wyoming, Tennessee, Arizona, and North Carolina. The farthest they traveled from home was Needles, California. Kathy suggests staying close to the interstate highways when traveling across the country. She said she refers to the many books she bought with references to RV Parks, and makes reservations in advance, just like for hotels. Also, she said that Wal-Mart usually lets RVs use their parking lot overnight, which saves money, if your holding tank is full of water. Her advice to novice RV travelers is to always have duct tape on hand, and that roadside assistance service is a must for RV motorists. Another problem can arise at gas stations, so look for books that list all the RV accessible service stations, plus more information. Storage of RVs takes a bit of preparation when not in use, so Kathy suggests to always drain all the tanks and keep some vents open for air, especially in hot weather. “We knew someone who had a window blow out from the heat,” said Kathy. She went on to say that in the winter you need to winterize the water lines to keep them from freezing and bursting. Speaking of mice, after communicating with a representative from earthkind, I received more earth-friendly information and a few more suggestions for all the RV fans. • Tidy Up. Having trash or clutter around provides food sources, nesting materials, and hiding places for rodents. • Keep any non-perishable items in air-tight containers so that rodents cannot access them. • Repair holes and cracks. Make sure to check outside, inside, over and under your camper for any holes or cracks that mice may be able to fit through; ¼ inch is all that they need to get in. • Windows should be looked over for any gaps along the edges. Windows with holes or cracks should be replaced. So armed with all this first-hand information, I feel more competent that I, too, could become an RV enthusiast. I asked Kathy how life is now that she and Bill have retired from their days on the open road. 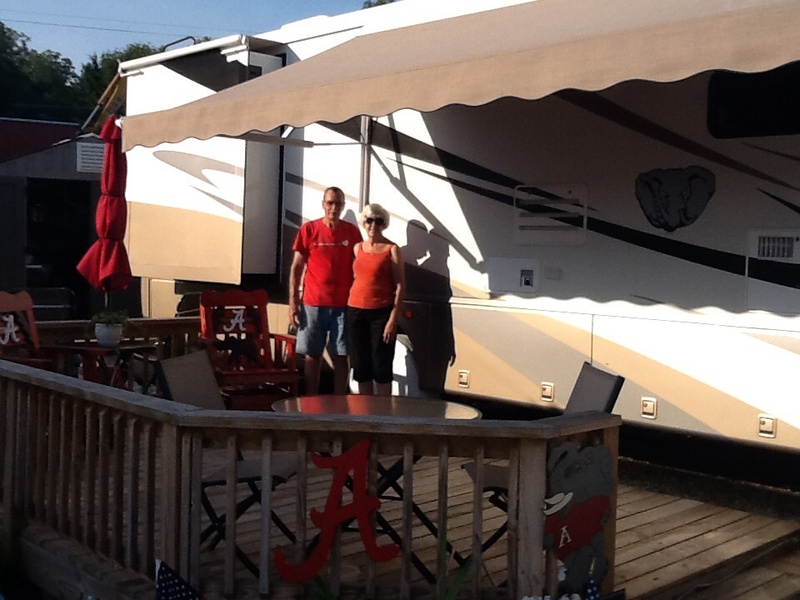 Bill and Kathy Alexander at an RV Resort in Talladega, AL, a beautiful place on the lake.